Illinois Baptist Disaster Relief (IBDR) is back in Taylorville to help with ongoing clean-up after an EF-3 tornado last December. Storms across central Illinois on Dec. 1, 2018, spawned a record high number of tornadoes, affecting several communities, including the city of Taylorville. 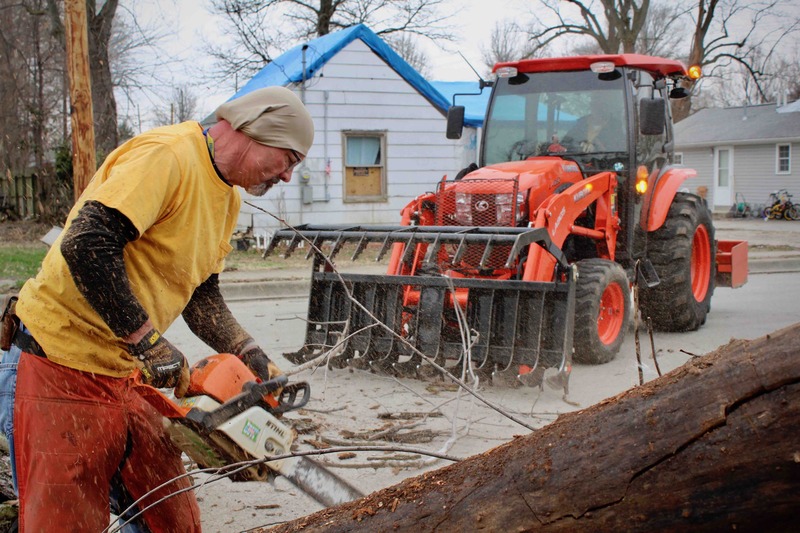 Disaster Relief teams mobilized to Taylorville soon afterward, with assessors working to evaluate needs and chainsaw teams removing limbs felled by the storm. However, there are many more trees in the area that still need to come down. The team of 20 volunteers is only in the area for a few days. “After we leave, we’ll hand it over to the city,” Porter said. One homeowner, Mary, expressed gratitude for the volunteer team’s efforts. “I had just moved here in October before the tornado hit,” she said. The retired attorney from Chicago had moved to be closer to her sister. “I think what they are doing is just so kind,” she said. The Disaster Relief team arrived in Taylorville April 3 and will turn operations over to the city once they leave April 5. They are one of many units helping out in central Illinois. “We try to stay until the job is finished,” Porter said.